The engine was unsiezed after much effort, and overbored by 0.010". After finding traces of dark green paint Don did some research and established it was the correct original Morris Green colour for this car. (The blue colour is from Sikkens Automotive Paints # BL -U2, Page 332. Match D2). 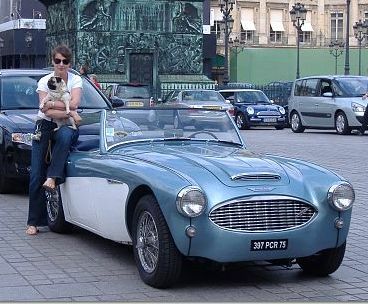 Here is a picture of the car in late 2005 with my wife and our pug. The photo was taken in Place Vendome in the centre of Paris and shows the car without its bumpers. During this period I also fitted a Dennis Welch side exhaust and headers and a Moto Lita steering wheel as I was going for a more 'sporty look'. I then re-installed the bumpers for the trips to LeMans and Warwick in 2006. 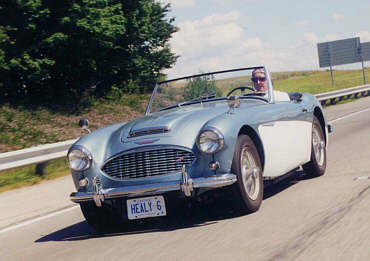 "Healy 6" was an Ontario plate. 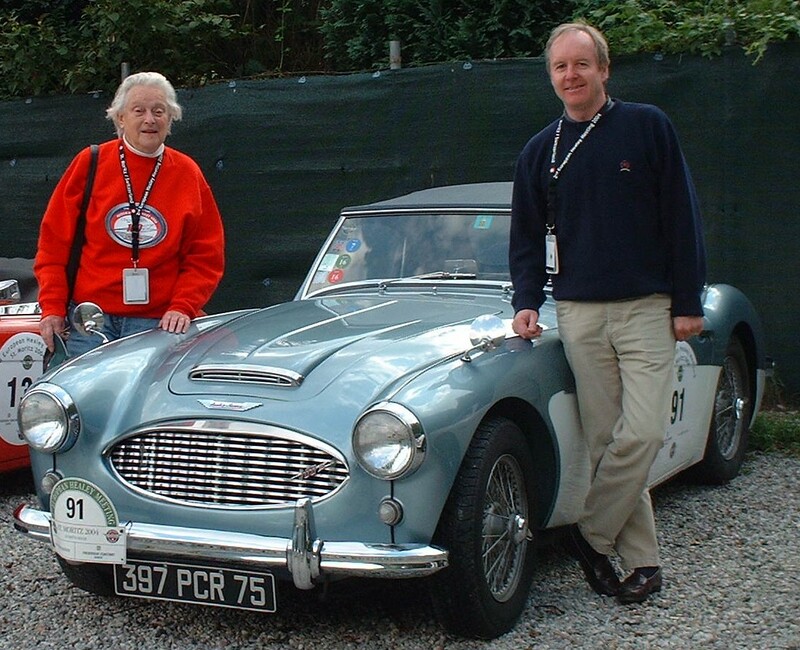 While attending the 2nd European Healey Meeting at St Moritz in 2004 I had the privilege of driving Margot Healey from St Moritz , over the border and into Italy for the track day, which was held at Gordonna-Chiavenna. Margot was born in Italy and speaks the language fluently - this came in very useful when I made a wrong turning and got lost!! Don spent the next three years restoring it to its current immaculate state. 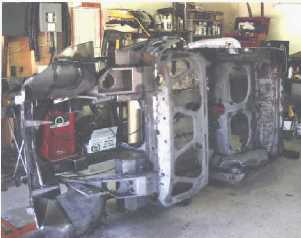 When he dismantled the car the chassis was found to be much worse than imagined so it was jettisoned. He replaced it with a new one from Martin Jansen of Jule Enterprises of Ontario. (See ads in Healey Marque). The chassis is stronger than the original and gives the car a very solid feel. with no scuttle shake. In January 2007 we left France to begin a new phase of our life in Malta. I reluctantly made the descision to sell my Healey, mainly because of importation issues and also the fact that, as Malta is a very small island with some sub-standard roads and a 40 mph speed limit I did not think it was worth having the car here. I am regretting the decision a little as there is actually quite an interesting classic car scene here on the island as well as an excellant Classic Car Museum. Anyway its too late now as my pride and joy was sold in March 2007 and has gone to a very good home in the French countryside where she will be exercised on French roads perfect for a Healey. Donald Healey didnt like these and assumed people would change them when they bought the car. He fitted them because they were cheap. My car is BN4L 56053 indicating it was built at Abingdon around the middle of January 1958. It has the 6-port head which makes it a 100-Six "MM". The car spent most of its life in Ohio where it rotted away at an alarming rate. 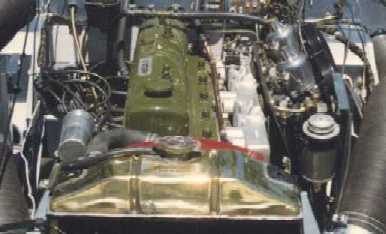 It was purchased by Don Kee of Terracotta, Ontario in 1993 as a rusted hulk with a seized engine. 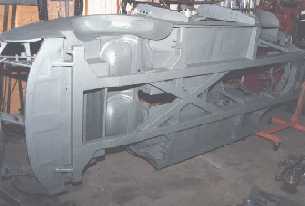 As many of the old parts as possible were used in the restoration with all the shiny bits being rechromed. I think its common knowledge that new parts are not up to the quality of the old ones. One of the few non standard parts is the fuel pump, its a $70 Walbro item from Canadian Tyre and does the job fine. No problems in 7 years.